The Yambuk Inn stands on land which was originally part of the Yambuck pastoral run first taken up by Lieutenant Andrew Baxter in 1843 when Baxter and his wife Annie Baxter travelled overland from Port Macquarie to take up the run. By 1851, the run had passed into other hands but the Yambuck name remains primarily associated with Annie Baxter [later Annie Dawbin] who kept a remarkable diary while at the property which documents settler life and provides graphic accounts of clashes between local Kooris and European settlers in the district. The small township given the name of Yambuk which gradually developed on the Shaw River and beside Lake Yambuk providing an important stopping place for travellers between Port Fairy and Portland. A timber bridge spanned the Shaw River in the early years before a more permanent bridge was erected in 1856. The site of the hotel immediately outside the Yambuk township reserve was first purchased by Michael Cummins in 1855. In 1856, Cummins sold to Cornelius Carlin [sometimes Carolan] who erected a timber hotel on the site. John Kelly acquired the property from Cornelius Carlin in 1859 and Kelly is first recorded as applying for a publican's licence in the same year. 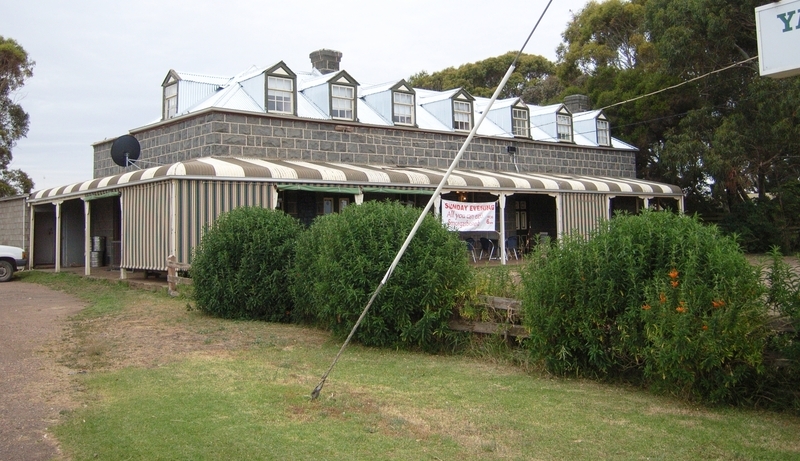 In 1870-1871, Kelly built a new stone hotel to the design of by Port Fairy architect Captain John Mason, reputedly on the site of the previous timber building. John Mason played many roles in the life of Port Fairy, being at different times, an innkeeper, architect, estate agent, Captain of Militia and building contractor. As a builder, Mason constructed the Port Fairy post office in 1881. James Kelly, however, appears to have over-extended himself financially and the mortgagees sold the property to Thomas J Coughlan [sometimes Coghlan] in 1872. In 1882, Coughlan applied to change the name from the Yambuk Inn to the Commercial Hotel but it appears that the hotel may have been operating under this name since at least 1875 when local doctors Lupton and McNamara offered consultations at the hotel on a regular basis. Like the previous owner Kelly, Coughlan eventually lost the hotel in financially difficult times when mortgagees foreclosed in 1897. The hotel has passed through a number of ownerships and publicans during the twentieth century but the building remained largely unchanged externally apart from the addition of a verandah of Edwardian appearance which runs across the front of the building. The hotel now carries the name of the Yambuk Inn, which has been the name of hotel for the majority of its life. The Yambuk Inn is of architectural and historical significance to the State of Victoria. The Yambuk Inn of 1870-71 is of architectural significance for its distinctive one and half storey form and the late representation of the persistence of early Australian colonial vernacular tradition forms in regional Victoria. The attic roof structure is evocative of early building traditions in New South Wales and Tasmania and possibly reflects local taste or the provincial practices of the Port Fairy architect and builder John Mason. The hotel is one of few surviving examples of the work of John Mason, who played many roles in the life of Belfast, being at different times, an innkeeper, architect, estate agent, Captain of Militia and building contractor. The Yambuk Inn is of historical significance for its representation of the importance of Yambuk as stopping place providing accommodation between Port Fairy and Portland since the early 1850s. Shire of Belfast. No. 270.The Commercial Hotel, Yambuk. The Yambuk Inn stands on land which was originally part of the Yambuck pastoral run first taken up by Lieutenant Andrew Baxter in 1843 when Baxter and his wife Annie Baxter travelled overland from Port Macquarie to take up the run. By 1851, the run had passed into other hands but the Yambuck name remains primarily associated with Annie Baxter [later Annie Dawbin] who kept a remarkable diary while at the property which documents settler life and provides graphic accounts of clashes between local Kooris and European settlers in the district. The small township given the name of Yambuk which gradually developed on the Shaw River and beside Lake Yambuk providing an important stopping place for travellers between Port Fairy and Portland. A timber bridge spanned the Shaw River in the early years before a more permanent bridge was erected in 1856. The site of the hotel immediately outside the Yambuk township reserve was first purchased by Michael Cummins in 1855. In 1856, Cummins sold to Cornelius Carlin [sometimes Carolan] who erected a timber hotel on the site. John Kelly acquired the property from Cornelius Carlin in 1859 and Kelly is first recorded as applying for a publican’s licence in the same year. 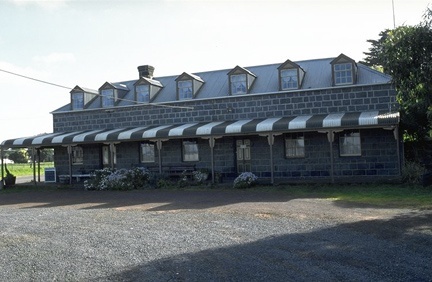 In 1870-1871, Kelly built a new stone hotel to the design of by Port Fairy architect Captain John Mason, reputedly on the site of the previous timber building. John Mason played many roles in the life of Port Fairy, being at different times, an innkeeper, architect, estate agent, Captain of Militia and building contractor. As a builder, Mason constructed the Port Fairy post office in 1881.